Okay, I’ve read another couple of titles off my TBR pile. 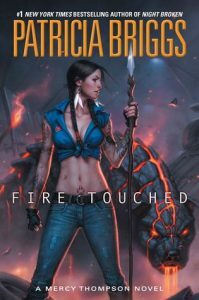 Plus I finally gave in and bought FIRE TOUCHED by Patricia Briggs, because I really, really wanted to read it and now I have. One disappointment, one implausibility, but basically a satisfying installment of the Mercy Thompson series. This took me a little while to get into, for a couple of reasons. It’s near-future SF, not my favorite type of setting, that’s one. Then I wanted to like David, AKA Captain Black the Space Pirate. David is our first pov protagonist and therefore feels like he should be the primary protagonist plus the good guy and the guy we root for. But he is such a total jerk. Honestly, he seems to have sociopathic tendencies – other people don’t seem to be quite real to him. Then our secondary protagonist, Elizabeth Santiago, an Air Force captain, is much more sympathetic but also . . . maybe a trifle boring? Or maybe the problem is that she is a bit ineffectual. She is trying to set things up to thwart David, but her (slightly illegal) plans get discovered and go nowhere. A third pov character, Anne, drifts along, tangential to the actual plot, and one wonders what the heck she has to do with anything. Then the story takes off. The real bad guys appear, so it gets easier to root for David. Shortly after that, David gets shocked into noticing that other people are real after all and actually grows up a bit and becomes a lot more likeable. Anne gets pulled into the primary narrative. Elizabeth sorts out her priorities and goes for broke to stop the real bad guys, and I would say that she and David team up, except that it’s not exactly voluntary on David’s part. When Elizabeth gets going, she is pretty hard to say no to. The pace picks up and whoosh, straight through to the end. Plus an epilogue so we can get the i’s dotted and t’s crossed. 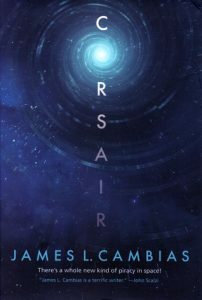 Overall a satisfying story, and though I hope Cambias goes back to designing alien species for this next book, I do think I’ll be willing to pick up whatever he writes next, even if it’s another near-future SF story. Okay, so I sometimes don’t feel like starting another new-to-me book right after finishing one, so I picked up FER-DE-LANCE by Rex Stout instead of anything off my TBR pile. I’m sure I’ve read Fer-de-Lance before . . . it’s the very first Nero Wolfe mystery, and I’ve read all of them, but I didn’t actually remember it. Well, I read through the Nero Wolfe mysteries a long time ago. Rex Stout hasn’t quite settled all the elements of his characters and world down yet in Fer-de-Lance, but all the essentials are in place. Every now and then I miss a reference – it was written in 1934, after all – but that certainly does give that feeling of depth to the setting. I liked this one, though not as much as later installments. Do you realize that in twenty years, the Nero Wolfe series will be 100 years old? And I’m sure people will still be reading and enjoying these stories. Pretty amazing. All right, after that I guiltily stepped away from my existing TBR pile, gave in, and bought FIRE TOUCHED by Patricia Briggs. What can I say? It’s been in the back of my mind since it came out and I finally decided I really, really wanted to read it, even though it was still more than ten bucks for the ebook. The disappointment: I like Honey, I keep expecting Briggs to give her a somewhat more central role, but not in this one, either. Well, there are so many characters, it must be hard to pull any of the minor characters into the spotlight. Still, I was disappointed. The yeah-sure moment: Wow, it sure was easy for Adam to sort out the problems between his pack and Mercy. Makes one wonder why he didn’t take care of that a long time ago. Yes, there was a nod toward I’ve-been-wanting-to-do-that, but I still found myself rolling my eyes. The relief: I’d heard there was a death in this one, which turned out to be a trifle misleading, though not actually untrue. I’ll just add that nobody I particularly cared about died. The story: Another fun installment. I’d have liked Bran to play a larger role, but I usually feel like that. I sort of wonder whether the trouble between the fae and the humans will be that easy to sort out, but on second thought, maybe it wasn’t actually all that easy – and there’s lots of room for continuing trouble. Now reading: KINGFISHER by McKillip. I’m only halfway through it, though, because I’m also trying to (finally) finish this Black Dog short story. Well, novella. That’s why it’s taken so long; it keeps getting longer and more complicated. Just about got it today, though. I’ll finish it tomorrow.